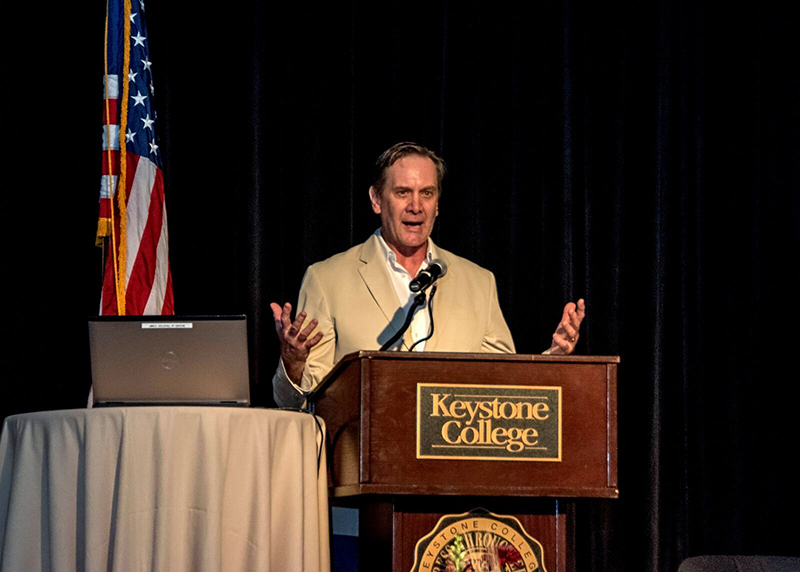 In October 2017, DFCLT hosted our Fifth Annual Dennis Farm Symposium at Keystone College and the farm. Our keynote speaker, Emmy and Cine Golden Eagle Award-winning documentary filmmaker, Gregory Matkosky, proved to be the highlight of the program. In his presentation, Introducing the Dennis Farm Documentary Film Project, he described the impetus behind producing a documentary film about the Dennis Farm and its history. His truly fascinating presentation, which held the audience in rapt attention, included excerpts from two of his films: Ubaldo, about an 800-year-old annual festival that takes place in only two places in the world, Gubbio, Italy and Jessup, PA; and one about the Knoebel family, the amusement park Knoebels, a Pennsylvania family that like the Dennis family goes back seven generations. Mr. Matkosky has been a filmmaker for thirty-five years. After graduating from Pennsylvania State University with a BA in Broadcast Journalism, Greg Matkosky earned his MFA in Cinematography from the American Film Institute’s Center for Advanced Film Studies in Los Angeles. He began his career in the commercial film and television industry, in LA. He then moved to documentary films and, in 2005, joined PBS television affiliate WVIA as Creative Director of Documentary Films. At WVIA, he directed, wrote, photographed, edited and co-produced 18 public television documentaries in 11 years, six of which were distributed nationally. Among his many film-related activities, Greg serves as an Advisory Panelist for the Pennsylvania Council on the Arts, a judge for the documentary division of the Emmy Award competition, and has lectured on filmmaking and numerous universities in the US, including Duke, Bucknell, and the University of Pennsylvania. If you would like to make a contribution to the Dennis Farm Documentary Film Project, please let us know by clicking Contact Us on this web site or by simply using this PayPal link.